I wore this outfit this past Sunday to church. I normally like to dress up a bit for Sunday service but it was a cold day and we, also, were going to help out the church after mass. Me and my husband helped out the Deacon and his wife with Pre Cana duties. We were happy to help out our church and it was a nice trip down memory lane, since we did pre-cana ourselves last year prior to our wedding. 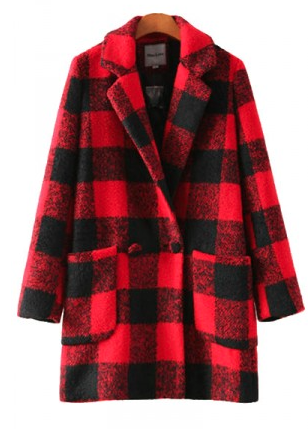 I wore this plaid coat, which I've had for two winters now. I love the plaid print and the bold red together. I paired it with distressed denim; honestly, this was probably not the best choice of jeans that day because it was so cold but I'm so over this brutal cold and I just don't care anymore lol. I recently purchased these booties from Shoedazzle. I've been looking for a heeled pair of booties that are comfy for everyday. These are super comfortable and I love the gold detail on them. Lastly, I added a red bag and a bold red lip. Have a fabulous Friday and weekend!! Love the coat. I'd totaly wear this look. I haven't ordered from shoe dazzle in the longest. Si viviera en el frío, de seguro usaría algo así! Saludos!